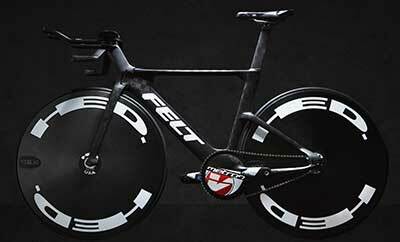 Felt Bicycles is one of the cycling industry's leaders in cutting-edge design, technology, and research and development. With a full range of road, mountain, triathlon, cyclocross, track, cruiser, lifestyle and electric-assist bikes, Felt's longstanding mission has been, and always will be, to design, develop and deliver the best bicycles in the world. Partnering with the U.S. Women's Team Pursuit squad, Felt Bicycles underwent a four-year development cycle to create the most revolutionary track bike the world has ever seen: the TA FRD. Featuring the most advanced airfoil technology on the planet and a radical left-hand drivetrain, the TA FRD shatters all preconceived notions about track bike design. 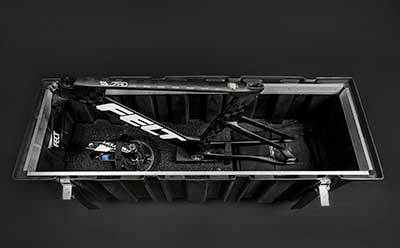 As part of Felt's mission to provide its customers with the industry's highest-quality componentry, Felt chose the Tri All 3 Sports Velo Safe case as the exclusive protection and mode of travel for the TA FRD. 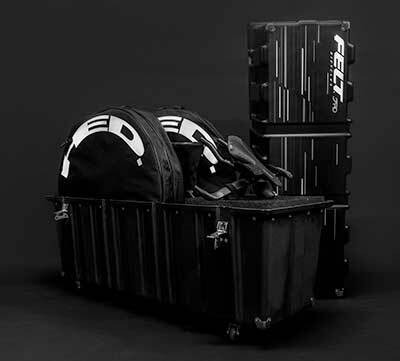 In addition to a host of proprietary and advanced componentry like multiple cranksets, two wheelsets and a wide variety of other accessories, each and every TA FRD customer receives a Tri All 3 Sports Velo Safe case with custom foam inserts to provide the best protection in the industry for both travel and storage. "We chose the Tri All 3 Velo Safe case for the TA FRD because it's the absolute best protection and storage solution around. It's the perfect size to fit all of the bike's components and accessories, and its handles and wheels allow for easy portability." CALFEE DESIGN PICKS TRI ALL 3 SPORTS AS THE EXCLUSIVE CASE TO PROTECT THE ULTIMATE TANDEM! Calfee Design, leading innovator in the creation of carbon fiber and bamboo bikes, has chosen the TRI ALL 3 SPORTS Velo Safe® Original case as the exclusive protection to be included with each collapsible Calfee Carbon Fiber Tandem. World-renowned for their exhaustive attention to detail and quality, Calfee Design discovered that by using a TRI ALL 3 Velo Safe® Original, not only did they have the Toughest Case On The Planet, it allowed them to cut the number of couplers needed in the frame from two down to just one, thereby reducing weight and cost. 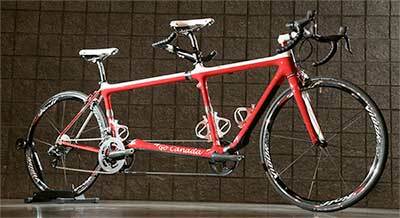 "The excellent TRI ALL 3 SPORTS case has become our go-to for safe and convenient tandem travels. Removal of the stem faceplate and rotation of handlebar is all that is required, leaving the headset bearing adjustment and steering alignment alone. Even the rear wheel stays in place. The interior of case provides just enough room for tandem with a small balance of space for the smaller items...perfect. TSA can lift the lid to view the inside contents without disturbing the attachments, and assembly upon destination arrival becomes a breeze for the client." Calfee Design chose to protect the ULTIMATE TANDEM with the ULTIMATE CASE: TRI ALL 3 SPORTS. Body Surfing gives you a full body workout, improves your stamina, refreshes your Soul and is just flat-out fun! Break up the boredom and free your body from the training treadmill. BAGGAGE ROOM GORILLA NO MATCH FOR TA3 CASES! CLAMSHELL WHEELSAFE® BEATS THE COMPETITIVE CYCLIST TORTURE TEST! TA3 WINS "BEST OF SAN CLEMENTE" AWARD FOR THIRD STRAIGHT YEAR! Each year, across the greater San Clemente area, the US Commerce Association chooses only the best local businesses. The companies chosen exemplify the best of small business; often leading through customer service and community involvement. Nationally, fewer than 1% (1 in 120) of the 2013 Awards were certified as Three-Time awardees. Your team is now a part of an exclusive group of small businesses that have achieved this selection. DON'T OVERPAY TO TAKE YOUR BIKE! If traveling domestically or internationally to your next race, please contact bikeflights.com (541-705-2453). They have a door to door discount program with FedEx that will beat UPS and the Airlines outrageous fee's. Check out our "NEWLY DESIGNED" CLAM SHELL BIKE CASE, lighter and stronger, molded handles, 6 point strap system, 2 casters for easy handling, foam padding and weighs only 26 pounds. Will accommodate up to a 58cm road bike. Very cool ! READ ABOUT THE GREAT BIKE CASE BEATDOWN! For all you 29'er fans, your very cool Specialized S Works, Orbea, Gary Fisher, etc. 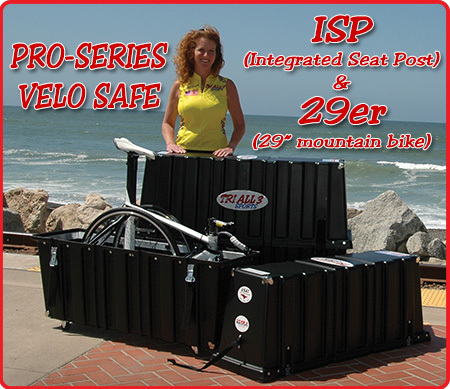 mountain bikes will fit into our Original Velo Safe or the new ISP Pro-Series Velo Safe case for shipping. Don't miss that next exciting event in Utah or Colorado. THERE'S TOUGH, ARMY TOUGH, AND THEN THERE'S TA3 TOUGH! TRI ALL 3 SPORTS cases are not just used to carry and protect racing bikes or racing wheels. Our cases are used by the United States Government Armed Forces, Special Ops and just recently, Homeland Security. So if you want to feel secure that your valuable investment is truly protected, give us a call and we can discuss your security needs. For those of you who would like to keep your valauable investment locked up in your bike case when traveling, Master Lock has come up with a new TSA-approved combination lock. TSA agents can insert a key in the bottom of the lock to open it, then re-close your lock without having to cut it off. The lock's product code number is 4680DNKL. It costs about $8.00 and can be found at any good hardware store, Home Depot or Lowe's. TRI ALL 3 SPORTS Velo Safe® Pro-Series Bike Case was named "The Best Bike Case in Europe for the protection of your bike" in 2009. This was the result of an independent survey and evaluation conducted by a leading Euopean magazine. Travel with confidence, travel with the best! TRI ALL 3 SPORTS Bike Cases do not exceed the maximum length, width and girth of 164 inches established by the 2008 shipping standards for air services. Our bike and wheel cases conform to all 2008 A.T.A., T.S.A. and F.A.A. size and security regulations for the transportation of bicycles and racing wheels on airlines. 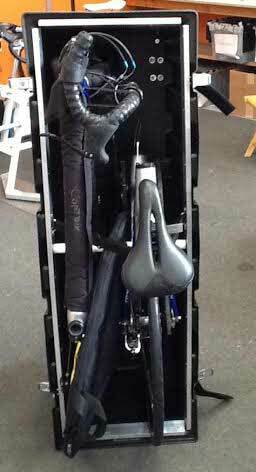 This case is specifically designed for Integrated Seat Post Bikes, 29er Mountain Bikes and other large frames. Made of High Molecular Weight Polyethylene and has the same features as out other Pro-Series Bike Cases. Interior measures 47"L x 13"W x 32"H and weighs 39 lbs. This case will also fit the new 29er mountain bikes. Don't let the AIRPORT GORILLAS destroy your valuable equipment. Only trust a TRI ALL 3 SPORTS case. 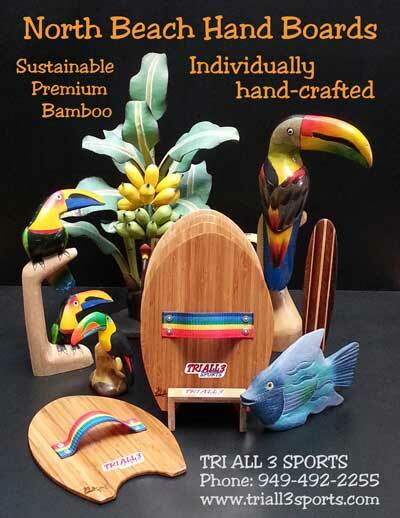 Our products are made in the USA and we recycle all raw materials to help protect our environment.